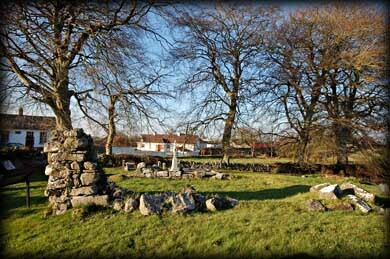 The 10th-12th century parish church ruins stand on land given to St Manchan by St. Ciaran of Clonmacnoise in order to build a monastery here in 645AD. It is believed that the land, referred to as "the island in the bog", had been given to St Ciaran in 644 as a thank you from Diarmuid, High King of Ireland who had stopped off at Clonmacnoise to ask the monks for their prayers for his battle success. The gift was conditional upon St Ciaran sending one of his monks to Lemanaghan to Christianise it. Nothing remains of that original monastery but the ancient graveyard, yet it was believed to be a monastery of some standing up until about the 14th century based on recorded deaths of Abbots. 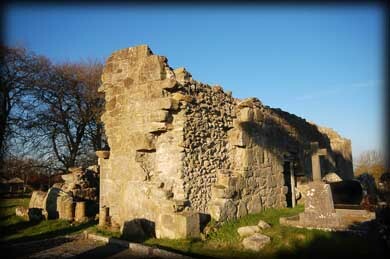 The middle of the roughly coursed limestone and sandstone church ruin probably dates to the 10th century. The western end was added with a Romanesque doorway in the 12 century. The church was extended eastward in the 15th century with the addition of a battered plinth and several one- and two-light cusped trifold headed windows that still remain. Two of the twelve 8th - 10th century cross-inscribed grave slabs are displayed on the interior walls. 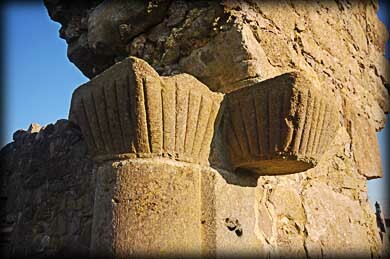 Additional interesting architectural details and the remaining cross inscribed stones are stored in the nearby schoolhouse which is now a visitor centre. Adjacent to the church are the remains of a foundation measuring 8.6 metres by 6.8 metres, believed to be of 15-16th century date. This structure may have functioned as a priest's house. 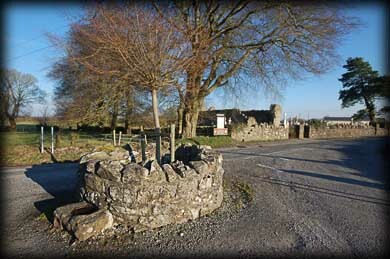 Located in the middle of the road back at the school house is a small circular wall that once enclosed another rag tree. At the base of the wall is a large bullaun stone. The stone is about 1 metre in length by 1/2 metre wide. 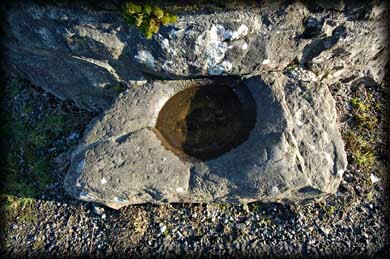 the bullaun is over half the width of the stone. The schoolhouse is facing this bullaun stone. There was also a castle quite close to here but it has been completely destroyed. Lemanaghan church may appear to be a disappointment at first, but with a bit of investigation some very interesting features reveal themselves. 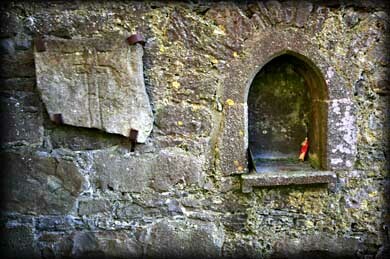 After visiting the church we walked up the togher to St Manchan's Holy Well. Situated: From Dublin take the M4 west then turn onto the M6. Take the Moate exit and head towards Clara. After 1.8 kilometres turn right. After 5 kms turn left then second right onto R346. Lemanaghan is 4 kilometres down this road. Discovery Map 48: N 171 270. Last visit March 2011.